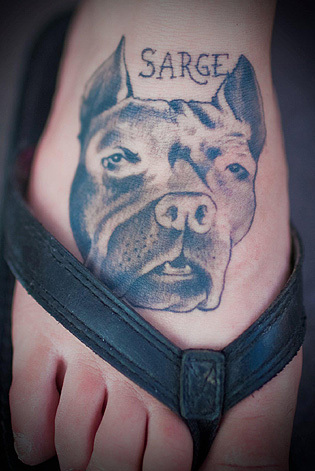 It seems pit bulls are like getting tattoos, once you have one, you want more. Thanks everyone for sharing. The black one is Big Mammas, the tan one is Dabos. (photo above) I got this tattoo of my babies about 7 years ago. Big Mammas passed away last July and Dabos is now 13 years old and still my best friend in the whole world. We miss Big Mammas every day, but we know we will see her again one day! They are both with me everywhere I go, in my heart and on my leg! I have my first rescued pit’s (Bogey) paw print tattooed on my ankle…a tribute to the start of a lifelong desire to share my life with rescued pit bulls! I have “CAVE CANEM” with my dog Roxy’s name under it on the back of my shoulder. This is my Wylie. (photo right) He passed away about 5 years ago, and I miss him every single day. He changed everything I knew, or thought I knew, about pit bulls and bully types. He was adventurous, brave, and loyal. Wylie was a love- he would put his big ole head down, then lean into you for a hug and kisses. He wanted nothing more than to be with you, no matter where that was – right next to you. I love him, and it was because of him I rescued two other pit bulls, and I will always open my home and arms to a bully breed dog. 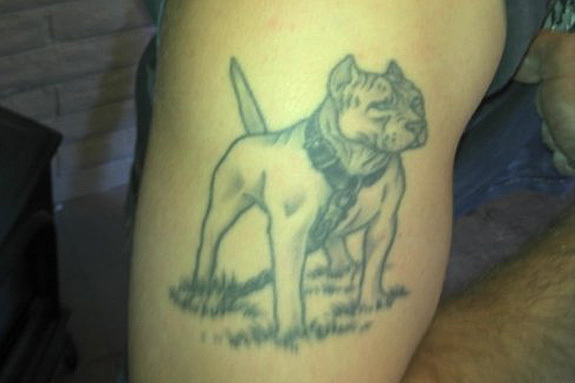 Lance, my husband, has a pit bull tattoo on his forearm. 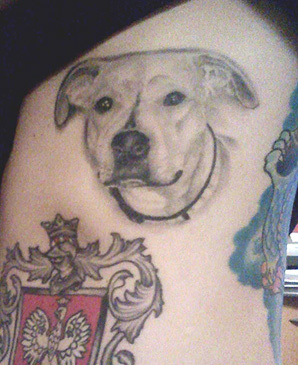 Not yet, but I have a tattoo planned that will not be an actual picture, but a memorial of my first pit, she was white and deaf and amazingly sweet. She unfortunately had a brain tumor that ended her life at only 1 1/2 years old. Her name was Feileacan, Gaelic for butterfly. So I have plans for a white with brown spots butterfly on my left hip cause that is where she used to cuddle with me all the time. I have the quote “My little dog ~ a heartbeat at my feet” on my foot, of course! I have one with my dog’s name and one of her mug. I get to look at her wherever I am! I also have the logo for the rescue I volunteer at, paw prints and the word pit bull and kanji of ‘dog.’ And one of a pigeon I saved once! I have one that’s a combined graphic of a Phoenix and a Sun for my first two pits, Phoenix and Apollo. I have more planned for the three I’ve had since then. Hi, I’m Sarge the Elderbull’s Mom! I never thought I’d get a tattoo. I also never thought I’d get a pit bull. Now I have both…..and want more of each! I have Pokey’s paw print on my foot. His pads are spotted, so i have it so it looks like he stepped on my foot and left the print. 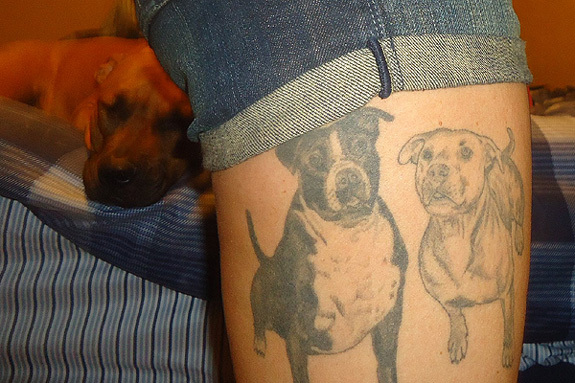 I have a pit bull head profile on my lower back that I got 11 years ago when I founded Power Breed Rescue. This year I’m getting scroll work done around it with my three pittie’s initials blended in. I have three dog paws on my shoulder and each print has the initials of one of my children. I am thinking about adding dog bones with my three dog’s names in each one of the bones. I have four paw prints in memory of my two babies that passed and my two that are still with me. I will continue to add more for each new baby I get. I have a paw print tattoo on the inside of my left wrist, right on my pulse. The main pad is in the shape of a heart. I got it when I had to put my little Shih Tzu down. I put it there because my dogs (and cats) will always be part of me, this way their paws will have a permanent link to my heart. 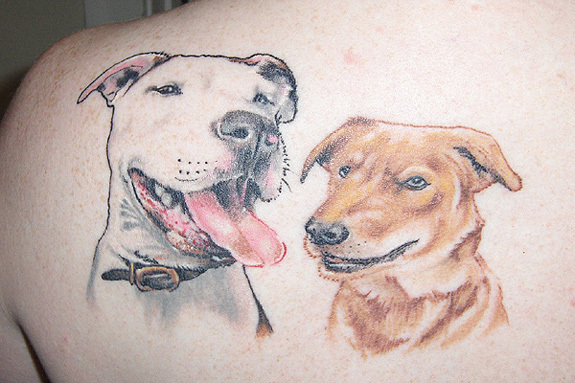 I don’t, but because of BSL my DOG has a tattoo, is that close? @skreidle Wow, that is beautiful. That is an incredible artist to do that free hand. Thanks for sharing. I have my Dozer’s (RIP) name about to be tattooed on the inside of my left wrist and on the inside of my right wrist I have 2 paw prints. I want to get my Savannah’s name or face on my left shoulder soon too. 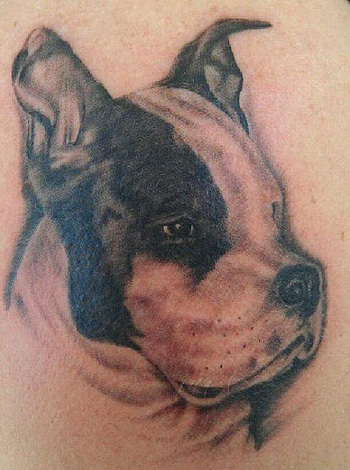 I have a photo tat of my AmStaff on my upper arm. She is the love of my life next to my hubby.